The February newsletter has slipped into March!We have the first of our visitors to the DugOut coming to stay at the end of the month. The DugOut is completely unique and therefore very special to us, it having been our own home for many years. We are very excited and looking forward to sharing the DugOut with others who want to experience a little of our ‘life on the hill’. Chestnut cleft slats were put to soak in January, to make them easier to weave. We then had repeated snow and frosts, the slats remained frozen solid so we had to bring them in to thaw out. Still, they became soft enough to weave into a lattice for the bed head and we are delighted with the result. 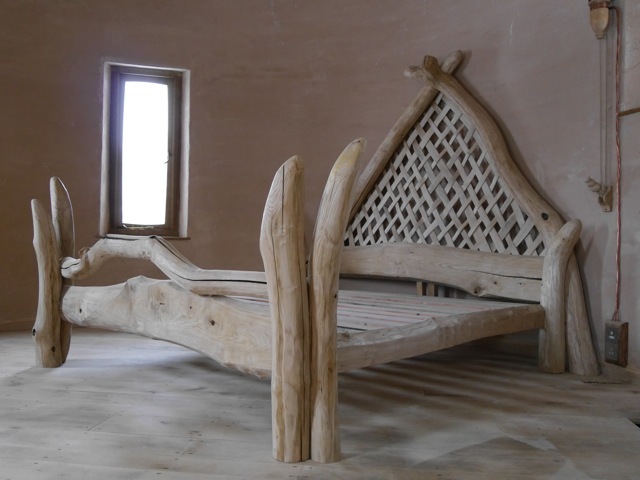 A few finishing touches to add and the bed will be complete. 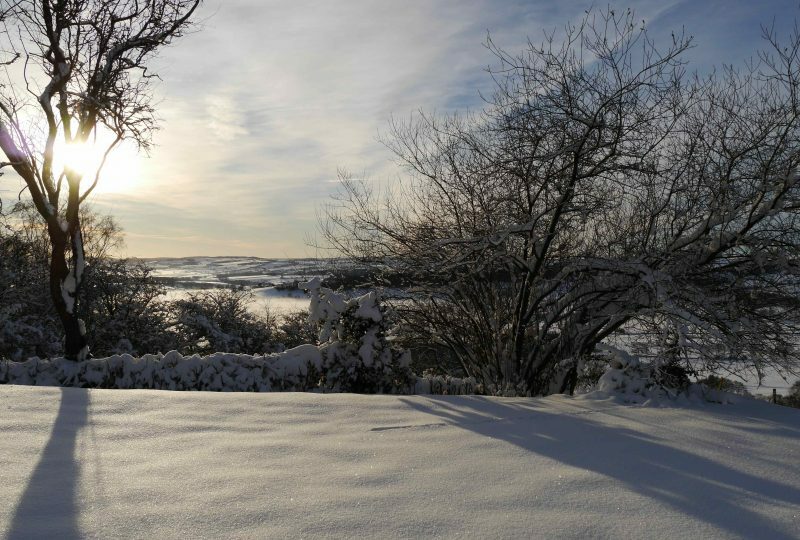 As I write this we are snowed in, as much of the country is also. All our outside taps and troughs are frozen and a great deal of extra time is spent carrying water to animals. The troughs are so frozen this week that it isn’t even possible just to smash the ice layer on the top, the water is all ice! Looby the mountain pony and the shetland sheep are made for this weather and they instinctively dig with their hooves, down into the snow, to get to grass. Minstrel the cob follows behind and, being the dominant animal, moves the others on from their dug patches and grazes, without the effort or instinct of digging herself. 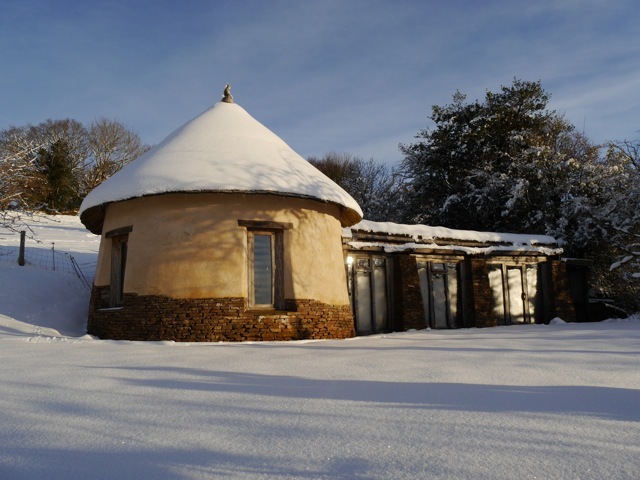 Although we’ve had a great deal of snow, we have also had a February full of cold and sunny days, with clear blue skies, the perfect weather for working outside. 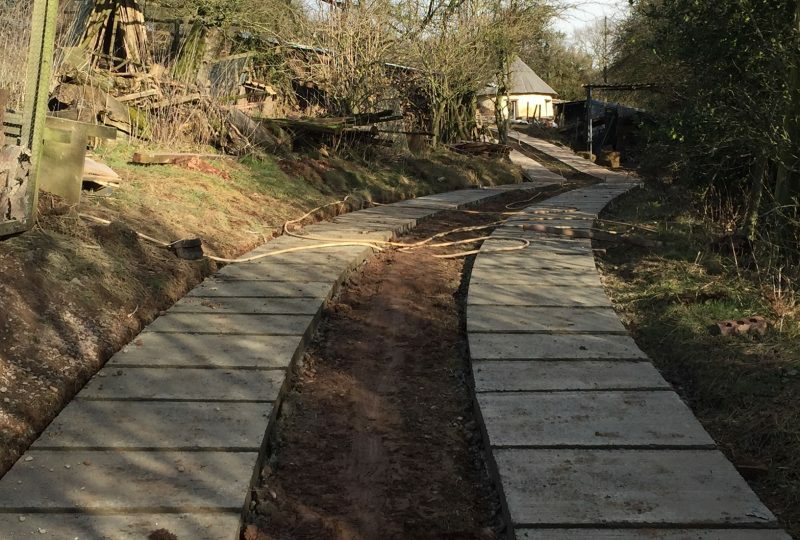 Come rain or shine, we had committed ourselves to ‘doing the track’ in February in order to make it usable for all vehicles, not just 4 wheel drives and cars that nobody was too worried about possibly bottoming! Amazingly, we have managed to work around snow and frost and the track is nearing completion. Soil needs to be reinstated down the middle of the wheel tracks and to the edges of the track. This will then grass up again and help the track settle back into the landscape. A huge thank-you to Will and Rob for enduring long, physically hard and cold days helping to make the track happen, the end result is brilliant. 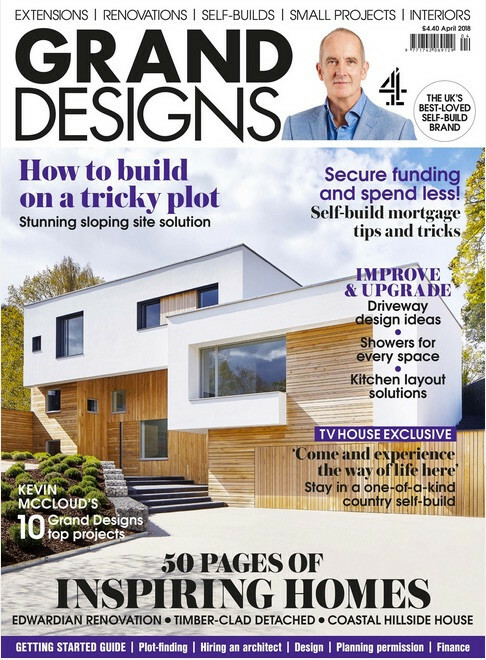 We have just been told that our Big House is the feature house build and TV House Exclusive in the April edition of the Grand Designs magazine, which is out now in March(!) We haven’t seen it ourselves but we’ll track one down. Otherwise we will be seeing it when sitting in the dentist waiting room in months to come! Here is a dhal recipe that is quick to make, nutritious and tasty. It also uses store cupboard ingredients, so great for a last minute meal too. Heat oil and cook onion for five minutes. Add garlic and spices and cook for one minute. Add squash and coat with spice mixture. Add tomatoes and stock and cook for ten minutes. Then add lentils and cook for a further twenty minutes until lentils are cooked. Serve with rice and mango chutney.